Found 1,578 blog entries tagged as "10306". Tuesday, October 16th, 2012 at 4:06pm. In the first half of the twentieth century, it was rare to find an architect who had never heard of Frank Lloyd Wright. Frank Lloyd Wright had made a name for himself by developing new styles of housing, including the Prairie style and the Organic style. He was known for his practical house designs and for his love of manufactured homes. After the Great Depression, he realized that what people needed were affordable homes. By the 1950s, he had teamed up with Marshall Erdman, a house manufacturer, to create a series of affordable prefabricated homes which would cater to middle-class Americans. Tuesday, July 10th, 2012 at 12:03am. 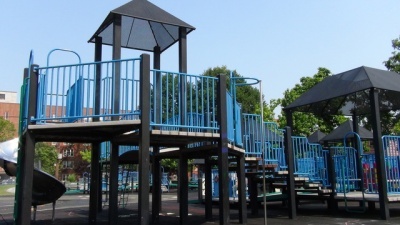 Dugan Playground is located in the neighborhood of New Dorp. This park is about three acres in size and stretches from Mill Road to Weed Avenue. Dugan Playground is bordered by these streets and is located between Tysens Lane and Isernia Avenue. In 1931, the New York City Department of Parks and Recreation obtained the land that makes up Dugan Playground. From the time that the New York City Department of Parks and Recreation opened this park up until 1974, this park was just an empty lot and did not have an official name. In 1974, the New York City Department of Parks and Recreation updated the empty lot into a nice playground for the community and renamed it Dugan Playground. This park was named for Gerard P. Dugan. Monday, July 9th, 2012 at 11:21pm. Cedar Grove Beach, located in the neighborhood of New Dorp, is one of Staten Island's newest public beaches, though it is still currently undergoing construction. Cedar Grove Beach is bordered by Ebbitts Street to the north and the Lower New York Bay to the east and south. Once it has been completed, the entrance to the park will be on the corner of Cedar Grove Avenue and Ebbitts Street. In the early 20th century this land was established as the Cedar Grove Beach Club. This was a private area that was used as a vacation spot. It included beach front bungalows, a clubhouse, a barn, a guardhouse, and garage structures. Friday, June 15th, 2012 at 12:29pm. In the neighborhood of Great Kills, 177 Woodcutters Lane, Staten Island, 10306 was publicly recorded as sold for $395,000 on 3/22/2004. This residence is a two-family home located on block 4645, lot 221. It was built with 1960 square feet of living space on 2231 square feet of land in 1994. Friday, June 15th, 2012 at 12:28pm. In the neighborhood of Great Kills, 143 Woodcutters Lane, Staten Island, 10306 was publicly recorded as sold for $443,000 on 10/28/2004. This residence is a two-family home located on block 4645, lot 230. It was built with 1890 square feet of living space on 1804 square feet of land in 1994. Friday, June 15th, 2012 at 12:26pm. In the neighborhood of Great Kills, 141 Woodcutters Lane, Staten Island, 10306 was publicly recorded as sold for $330,000 on 5/13/2004. This residence is a one-family home located on block 4645, lot 231. It was built with 1627 square feet of living space on 1095 square feet of land in 1994. Friday, June 15th, 2012 at 12:25pm. In the neighborhood of Great Kills, 126 Woodcutters Lane, Staten Island, 10306 was publicly recorded as sold for $290,000 on 4/30/2004. This residence is a one-family home located on block 4645, lot 202. It was built with 1258 square feet of living space on 924 square feet of land in 1994. Friday, June 15th, 2012 at 12:24pm. In the neighborhood of Great Kills, 37 Woodcutters Lane, Staten Island, 10306 was publicly recorded as sold for $325,000 on 6/7/2004. This residence is a one-family home located on block 4645, lot 264. It was built with 1866 square feet of living space on 1092 square feet of land in 1994. Friday, June 15th, 2012 at 12:23pm. In the neighborhood of Great Kills, 17 Woodcutters Lane, Staten Island, 10306 was publicly recorded as sold for $338,000 on 8/5/2004. This residence is a one-family home located on block 4645, lot 273. It was built with 1866 square feet of living space on 1092 square feet of land in 1994.